The number of unemployed Iowans decreased to 40,600 in November from 41,200 in October. The current estimate is 8,600 lower than the year ago level of 49,200. 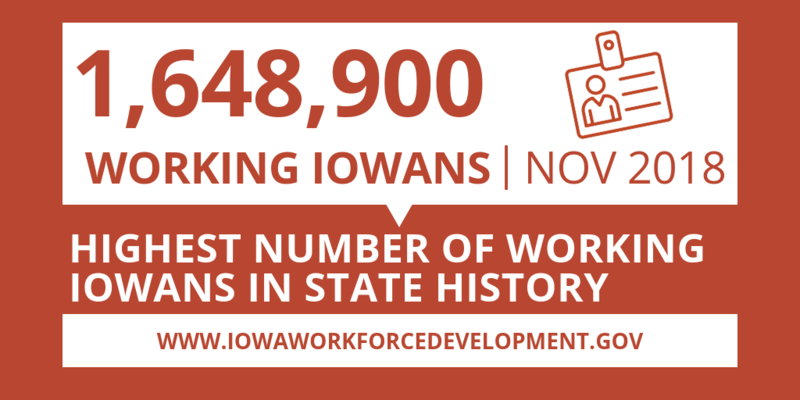 The total number of working Iowans increased to 1,648,900 in November. This figure was 1,900 higher than October and 23,300 higher than one year ago. Iowa establishments reduced payrolls slightly (-800) in November, leaving total nonfarm employment essentially unchanged versus October. Since June, Iowa establishments have alternated between gains and losses with service sectors generally trending down over the past several months. Alternatively, goods-producing sectors (manufacturing, construction, and natural resources and mining) have added jobs in every month since January. Government has been essentially unchanged compared to October and versus November of last year. Leisure and hospitality pared the most jobs this month (-1,400) with losses being heaviest in food services and drinking places. Recently, this sector has shown signs of reduced demand for services. Accommodations and food services shed jobs in six of the last seven months in Iowa. All other sector losses were small in nature and included construction, which lost jobs for the first time since January (-600). Also declining this month were education and health care (-600) and information services (-500). Alternatively, no sector added more jobs this month than manufacturing (+1,100). Gains were strongest in durable goods factories, specifically agriculture, construction, and mining machinery manufacturing shops. Through 2018, manufacturing has overwhelmingly trended up; losses occurred in only two months of the year and accounted for just 200 jobs lost. Despite continued weakness in retail, trade, transportation, and utilities gained 500 jobs in November. The advancement was mostly due to stronger than expected hiring in transportation industries. Smaller gains this month included professional and business services (+300) and financial activities (+200). Annually, total nonfarm remains 15,900 jobs beyond last November’s mark. At this point, most all of the annual increase stems from goods-producing sectors. Manufacturing is now 8,600 jobs higher than last November. Construction remains up 6,000 jobs. The professional and business services sector has added 2,100 jobs to lead all service sectors. Annual losses are heaviest in leisure and hospitality (-2,700) following this month’s large drop in accommodations and food services. 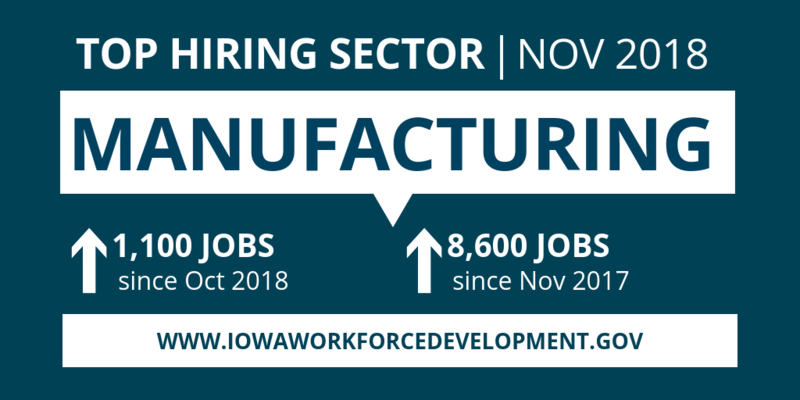 MEDIA ALERT: Click here to access an audio cut of comments about Iowa's labor market situation. Local data for November will be posted to the IWD website on Thursday, December 27, 2018. Statewide data for December 2018 will be released on Friday, January 18, 2019.